Cousins Denis and Sebastien manage 25 hectares of vines in the rugged and wild Ardèche in the southern Rhone Valley. Their family has been in the region since at least the 16th century, and Denis’ father Alphonse helped create the local wine cooperative in the 1952. Thirty years later, with the goal of passing his life’s work in winemaking on to his children, Alphonse decided to leave the coop and build his own winery. 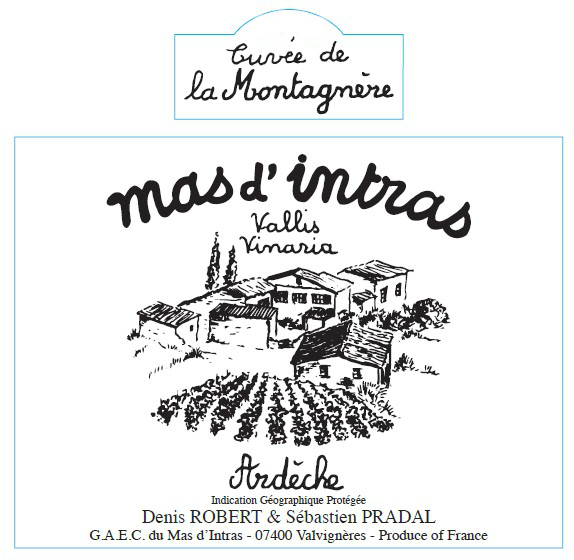 The first vintage of Mas d’Intras was in 1982. The domaine has 24 different parcels, planted to many different varieties: for the reds, Grenache and Syrah are most widely planted, but there is also Carignan, Cinsault, Cabernet Sauvignon, and Merlot. For the whites: Chardonnay, Viognier, and Sauvignon Blanc. In addition to organic certification since 2009, the domaine has taken other ecological approaches to running a winery. The wines are bottled in a special “feather” bottle that is 30% lighter, which reduces fuel consumption during the shipping. They use natural corks, recycled cardboard packaging, and have installed solar panels. Additionally, they make regular deliveries by barge throughout Europe for both professional and individual clients. Organic Agriculture certified by Ecocert. 2 hectares of 25 year old vines planted on clay-silt limestone. Southeast facing. Average yield : 35 Hl/Ha. Skin maceration for 24 hours. Pressing. Racking of the must. Fermentation from dry basic yeasts. Slight fining. Raised on lees for 4 months. No stabilizers. Earth filtration, then filter plate to block the malolactic fermentation. Free SO2 around 20mg/L ; Total SO2 85 mg/L. Organic Agriculture certified by Ecocert. 3 hectares of 25 year old vines planted on clay-silt limestone. Southeast facing. Average yield : 60 Hl/Ha. Bleeding or direct pressurage according to the grape varieties. Racking of the must. Fermentation from dry basic yeasts. Slight fining. Raised on lees for 2 months. Earth filtration, then on filter plates to block the malolactic fermentation. No stabilizers. Free SO2 around 25mg/L ; total SO2around 80mg/L. Organic Agriculture certified by Ecocert. 2 hectares of 30 year old vines planted on clay-silt limestone. Southeast facing. Average yield : 50 Hl/Ha. Destemmed. 2 weeks maceration, between 18 et 27°C. Pumping-over. Minimal sulfites added at harvest, then after malolactic fermentation. Fermentation from dry basic yeasts. No other intervention. Elevage 18 months in concrete tanks. At the estate, with our own material. No filtering or stabilizers. Adjustment sulfiting. Free SO2 around 15mg/L ; Total SO2 around 40mg/L. Organic Agriculture certified by Ecocert. 2 hectares of 40 year old vines planted on clay-silt limestone. Southeast facing. Average yield : 35 Hl/Ha. Destemmed. 2 week maceration between 18 and 27°C. Minimal sulfites added at harvest, then after malolactic fermentation. Spontaneous fermentations. No other intervention. Elevage in concrete tanks. No filtering. Free SO2 around 10mg/L ; total SO2 around 30mg/L.